“GETSEOBot.com” - Automated SEO Platform for Resellers and End Users. San Juan Capistrano, CA, May 23, 2011 – BWP Inc. announced today the unveiling of its new website GetSEObot.com that was designed to make the business of Search Engine Optimization or SEO much easier and more profitable. The Company said that the “GetSEObot.com” Automated SEO platform was developed for resellers supporting or having influence on small to medium size businesses who desire having their websites appear first in major search engine queries or SERPS. These resellers would include companies that offer web hosting services, Internet marketing, SEO services, PR firms, web design firms, and online business consultants. The getSEOBOT.com platform enables resellers to quickly add keyword specific content without having to touch the existing structure, format or content of the client’s website. 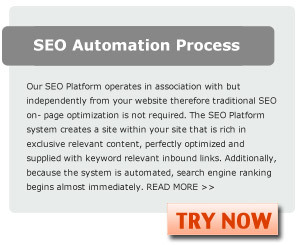 Additionally, on-page optimization is done automatically by the system as well as all relevant inbound linking. “The operator simply decides on the keywords or keyword themes and enters the original content into our online template and the system does everything else automatically” said Eric Nester the Company’s Vice President of Operations. There is no cost for the reseller to sign up and the platform can be customized to reflect the reseller’s brand. The Company is paying a 50% residual on all sales made by the reseller. Another application according to the Company is for Pay-Per-Click (PPC) customers that want to quickly and easily improve the keyword relevancy and authority of their landing pages. “By improving Quality Score, AdWords customers can save thousands of dollars and improve the ranking of their ad placements” ”, said Rob Bibb the Company’s president. “This application is a God send for those businesses spending a fortune on PPC campaigns” said Mr. Nester. “GetSEObot.com is an example of how a reseller can customize their own site “continued Mr. Bibb. The GetSEObot platform is currently available for anyone that would like to try it for free. The user gets 5 free keywords and full access to the systems capabilities to evaluate. “This is an evolutionary step for SEO because we have eliminated many of the time consuming aspects to getting keywords highly ranked” concluded Mr. Bibb. Better profitability for your online business can be achieved with the right search engine positioning software. GetSEObot – an automated and rebrandable platform – is an ideal optimization solution that offers instant link building, a key aspect when you want to rank in keyword searches. Find out more by signing up for the free service ASAP. Great content and a user-friendly layout may be important in a website but they’re not enough to guarantee better visibility in Google, Bing, and Yahoo. The right search engine optimization SEO software is what you need to finally give your site the push it needs to get more traffic and better conversion rates, as well as build a good reputation for your business. This cost-effective and time-saving solution should significantly be more affordable than other marketing and advertising services available. But with so many of these software products to choose from, you may want to look at the factors beyond the price tag to see if which one can provide you with the right SEO tools. Using SEO software does not guarantee automatic and overnight rankings. Remember that a long-term campaign will take some time to complete, but with White Hat SEO techniques and with the support of a good SEO software, it should not take too long. Before you sign up and buy the software, learn about the company that made it first. See if the company is an experienced SEO firm and if it has satisfied clients. If you are still unsure on which search engine optimization SEO software you should purchase, take a look at our WEB WORKS 2.0 component plug-in here in GetSEOBot. This revolutionary technology makes obtaining relevant links and on-page optimization automatic, enabling you to focus more of your attention on the money-making aspects of your business and let the plug-in do all the work for you. You may also choose to rebrand and resell this tool to your clients and earn extra income. Find out more about it in this website. High ranking in search engine results equates to better visibility and in turn more profits for your online business. If your goal is to rank in the top 3 results for your targeted keywords, then search engine placement software such as GetSEObot is a wise investment. Simply sign up and watch your ranking improve. • Better targeted keywords and targeted traffic. To reach your target audience, you need to know what they are looking for – specifically, the what keywords they search for in order to find your products and services. A good software or plug in should help you in selecting targeted keywords. • More visibility, long-term positioning. Combining your existing SEO efforts with search engine placement software that automates some of the processes, such as link building and regular content creation, often helps you retain high rankings. • Analytics. You get monthly reports that track show your progress. These reports help you identify the strengths and weaknesses of your campaign and make adjustments as necessary. • Great customer service. 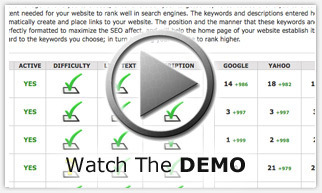 GetSEOBot provides you with the WEB WORKS 2.0 component plug-in which automatically builds links and pages for SEO. This patent-pending plug-in is also available for rebranding. Joining GetSEObot is easy because you can sign up right in this website. Get regular reports on your rankings along with other utilities for managing keywords, content, and links. You can learn more about our service when you explore this website or talk to a live chat representative. For a website to attract an increasing number of online visitors, it must attain high search engine rankings. In order to attain high rankings, it is essential to have relevant content and link popularity. Having relevant content and link popularity are legitimate strategies to increase rankings. Search engine algorithms always look for relevant content and link popularity when scoring websites. Get professional advice when trying to improve your search engine rankings. If an expert advises you to utilize paid listings to promote your website, do so. Also utilize email, as well as affiliate, marketing. When using these strategies, however, have an assurance that your website will receive higher rankings. Monitor your website regularly. Track its progress, and evaluate the number of pages that have been indexed by search engine crawlers. Spamming should be avoided. Avoid hidden text and unnecessary keyword repetition also. Keyword repetition should always be kept at a minimum. When submitting to directories, it is important not to enter only one URL over and over again. Also make sure that your hosting service does not also host adult-oriented sites. For doorway pages, utilize these appropriately. The Meta refresh command should be set in half a minute. If you use any of these prohibited search engine optimization techniques, your website can be banned. For a website to increase its search engine rankings, it should have enough back links. The number of inbound links, or links that lead to the website, should reach the minimum amount. Search engine algorithms assess the value of these back links when indexing web pages. Search engine algorithms do not just focus on the quantity of back links. Search engine algorithms also focus on the quality of the back links, too. When putting back links, it is important to enter the correct title, as well as meta tags. Also, it is important to consider keyword density and frequency. Keywords should come with suitable descriptions. In indexing web pages, search engine crawlers focus on these factors. Blackwood Productions can help you out in increasing your search engine rankings. Our company can provide you with higher search engine placement. Offering keyword rich optimized content, effective inbound links and optimized meta tags, our company only has the best search engine optimization techniques. Through our company, your website can have increased traffic, resulting to higher profits. At Blackwood Productions, we recognize the different requirements needed to attain higher search engine rankings. The goal of a search engine placement service is to market your website to search engines so more traffic can be driven to it. With that in mind, choosing the right search engine placement service is important if you want to achieve results that can really benefit your online business. However, since search engine optimization is not an easy task, you need to check on the methods of the company offering the service to you. The methods for search engine optimization can usually indicate the success of the service for your website. Here are some of them. Link building plays a major role in determining whether the search engine placement service can work for your website or not. This idea stems from the fact that the more inbound links your website has, the better it can rank in major search engines like Google, MSN, and Yahoo!. Professional search engine optimization companies know how important link building is so make sure that the service you are signing up for has this option included in their package. A professional company that offers a search engine placement service should know that high traffic and better search engine rankings are useless unless the conversion rate is high, too. Therefore, as part of search engine optimization, improving your website`s conversion rate should also be part of the major objectives. Search engines do not like websites with content that just seems to flood or spam the internet with repetitive and useless content. Therefore, make sure that your search engine placement company is using methods that do not involve spamming forums, blogs, other websites, etc. White hat SEO techniques are preferred by search engines over black hat SEO techniques that involve cheating your website`s way into search engines. It is important for the search engine optimization company to practice white hat search engine optimization techniques when working with your website. Remember that once the search engines find out that your website is using unethical methods, they could ban or suspend your website from appearing in their database, which can affect you and your business. For a search engine placement service you can count on without putting your website at risk, check with us at Blackwood Productions. We will provide you with quality SEO services that you can afford. We make use of the latest methods and tools for optimizing the performance of your website in search engines. Furthermore, we make sure that our methods are approved and do not go against the criteria of search engines regarding a website`s worthiness. No matter what your budget or needs are for your website, we are here to help your business grow without wasting anything. Without a high search engine positioning, your website cannot be easily accessed by online visitors. Most online visitors would miss your website especially if it does not land on the top pages of search engine results. Consequently, you would not have higher revenues. For your website and your business to succeed, it must attain a high search engine positioning. There are three essential components that your website must have in order to maintain its high search engine positioning. These are relevant content, optimized meta tags and quality links. Your website must have adequate yet substantial content. If you get to lead online visitors to your website, you must be able to give them satisfying results. Online visitors will spend time on your website if it has informative articles. If you are selling products or services, make sure that you provide them with the information they need. Include keywords, but always keep them minimal. You do not want to provide online visitors with mangled messages. Use the right keywords on your webpage content. Allow search engine engines to direct online visitors to your website using the right keywords. However, you need to make use of key word techniques that can improve the performance of your website. Make sure that the exact string of words online visitors enter on search engines is included in your website`s content. Use a software that analyzes keyword to determine what should be included in your website`s content. There are also search engines that can offer you tools that can analyze keywords. Your website can gain a competitive edge if it has quality back links. Your website can increase its authority if other websites link to it. You can opt for reciprocal linking, but you can always resort to one way links. One way links have more value. Make sure that your website has correct meta tags. These can be tags for description and keywords. Avoid using invalid search engine tricks, such as spamming, hidden text or cloaking. Increase your websites search engine positioning by getting the services of Blackwood Productions. Our company specializes in increasing search engine placement. Providing good content, quality links and optimized meta tags, we can guarantee that your website can increase its search engine positioning for a short period of time. For more information, explore our website. Blackwood Productions is a reliable search engine marketing firm. Increase the traffic of your website by attaining a high search engine ranking. Aside from increased traffic, a high search engine ranking can also result to higher profits. Skilled webmasters would advise you to go against your competitor`s website instead of search engines. Do not focus on how to beat the strategies of search engines. Instead, put emphasis on the inner workings of your competitor`s website and the ways on how you can beat them. Start off by knowing the search engine ranking of other websites compared to yours. If their website ranks on top of search engine results, they are utilizing effective search engine optimization techniques. Every inbound link is essential. Inbound links give authority to your website. With regards to the keywords, your website should have adequate density, as well as suitable frequency. Utilizing key words, meta tags, and inbound links can be easy, but bear in mind that quality matters. The websites that have links leading online readers to your website should have relevant content. The websites should be substantial. If the websites are not related to your website, the value of the inbound links is decreased. Do not just put inbound links in different websites. Make sure that the websites that your website is linked to are related. Owners of other websites may not also want to link to your website. Those website owners who would agree may want to link their website to the one you have. This reciprocal linking strategy can result to a higher search engine ranking, but it does not hold any guarantee. One-way links have higher value. Other websites have links to your website, but you do not have a link leading to them. Search engine algorithms judge one way links when scoring websites. Without these one way links, your website may have a hard time outranking other websites with regards to keywords. One effective way to secure these links is to submit unique articles, as well as your website, to directories. Some of these directories, however, require payment. Get the service of professional companies in increasing your websites search engine ranking. Blackwood Productions can provide you with higher search engine placement. You will be guaranteed that your website would have top rankings on Google, Yahoo!, and other search engines. Blackwood Productions utilizes effective search engine optimization techniques. These include optimized content, Meta tags and inbound links.